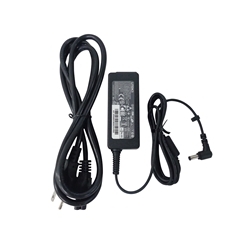 Description: New genuine Gateway 45 watt ac adapter charger with cord. This adapter will only work with the laptop models listed below. If you have another model please contact us before purchasing. Orders shipped to the US and Canada will receive an adapter and cord. All other countries will only receive the adapter as we cannot supply the correct cord. ***If ordering by part # please check the tip of the adapter to make sure that you are ordering the correct adapter. This adapter has a 1.7X5.5X11 tip. Compatible Part #'s: KP.04501.002, KP.0450H.002, KP.04503.002, KP.04503.008, ADP-45HE B, PA-1450-26, A045R021L-AC01-01, PA-1450-26AL, AG19023B011.